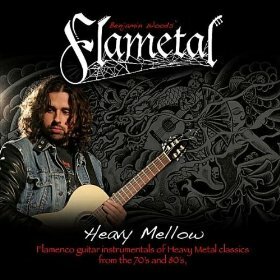 Hall of the Mountain King: Review: Flametal, "Heavy Mellow"
I’m a bit of a collector of offbeat recordings. I love strange stuff like (good) parodies, metal tunes covered by groups in other genres (and vice versa), metal Christmas tunes, etc. Given that, and the fact that I’ve always been a closet fan of flamenco guitar, Flametal’s Heavy Mellow was a must-listen for me. Guitarist Benjamin Maderas Woods has apparently released a couple of meldings of flamenco and metal under the Flametal banner over the years. This time, though, he’s decided to pay tribute to some of his metal influences with a collection of covers ranging from thrashers like Megadeth and Slayer to NWOBHM titans Iron Maiden to ‘80s commercial rock from Kiss to classic 1970s hard rock from the Scorpions and Rainbow. Surprisingly, most of the songs lend themselves quite well to the style. The album opens with a couple of thrash classics, Slayer’s “Spill the Blood” and Megadeth’s “In My Darkest Hour.” The main riff of “Spill the Blood” takes on a very exotic feel in the flamenco style, and while the clean intro of “In My Darkest Hour” works as well as you’d expect, the surprising star of the song is Woods’ guitar interpretation of the vocal melody. The latter, though, brings out one of the weaknesses of this record, and one of my least favorite aspects of flamenco, the palmas. For those unfamiliar, those are the hand claps that provide the rhythm for the music. Yes, I know they’re an integral part of flamenco, but occasionally they get really, really annoying. “In My Darkest Hour” is a good example, as is the cover of Ozzy Osbourne’s “Bark at the Moon” later in the record. From thrash, Woods dips into NWOBHM for a solid cover of Iron Maiden’s “Aces High,” followed by a trip to the 1970s for Rainbow’s “Gates of Babylon.” The Rainbow cover is one of the finer moments on the record (minus the palmas, of course). Sometimes Woods’ flamenco guitar just can’t deliver the power of the original, though. After the opening, one of my favorite Yngwie Malmsteen tunes, “I Am a Viking,” kind of loses its way. Likewise, my favorite Scorpions tune, “Sails of Charon,” becomes almost unrecognizable to me. It’s a nice piece of flamenco playing, I suppose, but loses too much of the original to my ears. The leads suffer at times, too, not in the talent of the guitarist, but just the fact that they occasionally sound a little more like elevator music than the ripping metal of the originals. The album closes with an original, “Cursed,” slated for the next Flametal record. Despite the classic stature of the covered tunes, this is probably the best piece of work here as it’s a better melding of the two styles and not an attempt to shoehorn one style into another. Steve Stevens joins the party on this track to provide some crunchy rock heft to the dark melody. 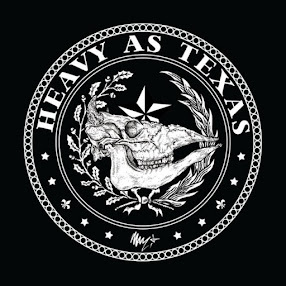 Obviously, Heavy Mellow is not for everyone, and some metal fans will likely be more annoyed than intrigued by the lighter treatment of some of the genre’s classic tunes. For those who appreciate good guitar no matter the genre, though, Flametal is certainly worth at least a listen. Hey Fred, this is Ben Woods of Flametal. I just wanted to thank you for taking the time to review the new album. I enjoyed your insightful comments and critiques. Got another one coming in 2011 with awesome guest appearances. I hope you have time to review that one too, when it comes out. Thanks again! Review: Nevermore, "The Obsidian Conspiracy"
Review: Danzig, "Deth Red Sabaoth"